Peyton Manning broke the touchdown passes record,in the second quarter, against the San Francisco 49ers. Manning completed an eight yard touchdown pass to Demaryius Thomas, to pass Brett Favre record of 508 touchdowns. That touchdown gave the Broncos a 21-3 lead. Manning now has 509 career touchdown passes and still has a few season ahead of him. He is on pace to throw close to 20 more touchdowns this season. I think he can play two more seasons, he is 38 years old, and can still throw the ball around like he’s in his mid 20’s. The offensive line in Denver, has done a great job of protecting him, only allowing him to be sacked six times this season. Manning has plenty of weapons around him and I wouldn’t be surprised to see him get 600 career touchdown passes. It took Manning just 246 regular season games to break Favre record. It took Favre 302 starts just to reach 508 touchdowns. Manning has been the greatest quarterback of this generation, but he still lacks the championships. He won his only Super Bowl in 2006, as the starting quarterback for the Indianapolis Colts. You have to think he has a good shot to win a few more, with the team that Denver has put together. Manning couldn’t play in his last season with the Colts, after having spinal fusion surgery. Some people thought he was done, but he proved all the naysayers wrong. Three years ago, he had just 399 career touchdown passes, but once he put that Denver uniform on he changed. I’m not saying he couldn’t have done this with the Colts, but he didn’t have the pieces anymore to keep achieving their. What he did in three years is beyond incredible and something we will probably never see again. 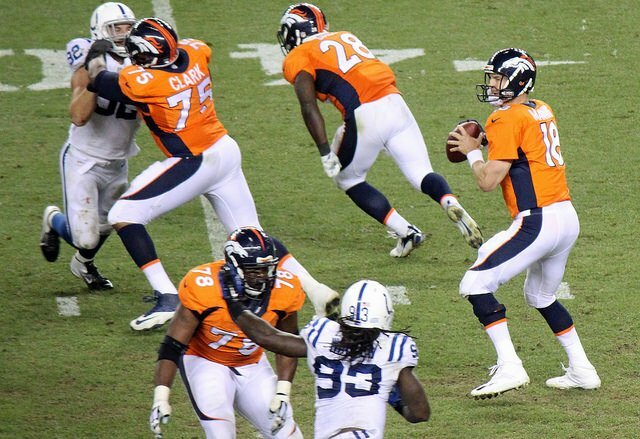 Manning has thrown 109 touchdown passes in just 38 starts for Denver. He is second to only John Elway, 300, for the most in Broncos franchise history. He has averaged 2.89 touchdowns passes per game, since suiting up for the Broncos. In his career he has averaged 2.07 per game. Peyton Manning will be the first to admit, that he couldn’t have done it without great teammates. Former Colts receiver Marvin Harrison has caught the most touchdown passes from Manning, with 112. Former teammate Reggie Wayne is second and with 67, and former teammate Dallas Clark is third with 44. Demaryius Thomas, has caught the most touchdown passes from Manning, as a Bronco with 29, including the record breaker. You have to think that Thomas will pass Clark soon, but I don’t think he has a chance at Wayne spot and he will definitely not catch Harrison. Drew Brees is the next active quarterback behind Manning, Brees has 374 career touchdown passes and counting. Brees is 35 and doesn’t have the same talent around him, that he once did, but I think he can still make a run at 500. Tom Brady is two touchdown passes behind Brees, with 372. Brady is 37 and is in my opinion getting close to the end of his playing days. Manning is a great quarterback, and there is no telling how many touchdowns he will end up with at the end of his career. I can’t wait to tell my kids one day about watching him play. We are witnessing a once in a lifetime quarterback and we might never see one like him again.